Trying to put more effort in collecting or playing with a train set does not only end with the quality and features of the train. You would also want to consider the possibilities of setting up or getting yourself a good and strong train table to where you can lay out the train set for you or your kids. 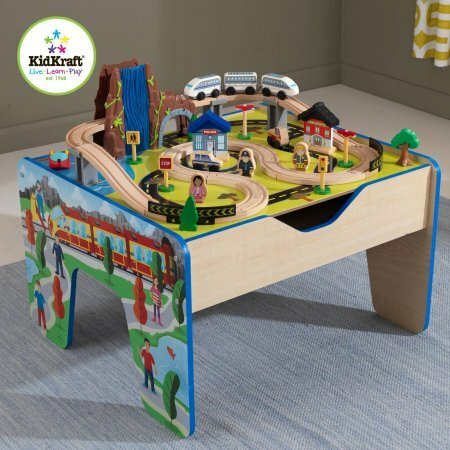 You can try to build your own but if you find it troublesome and tiring, then you can settle to purchase a ready-made and ready to use, right out of the box KidKraft wooden train table as it is built by one of the well-known manufacturers of train tables and train sets. There are certain qualities you need to assess. Each product is known to have its advantages and disadvantages and the only way for you to have a satisfying train table is when the pros weigh more than its cons. In addition, regardless of the features of the table, it must be able to withstand certain outdoor or conditions and play style. It must be built with great sturdiness and uses high quality materials for long lasting durability as people at younger age, especially kids, can sometimes play roughly and try to beat the train down. The quality of wooden furniture is very important. 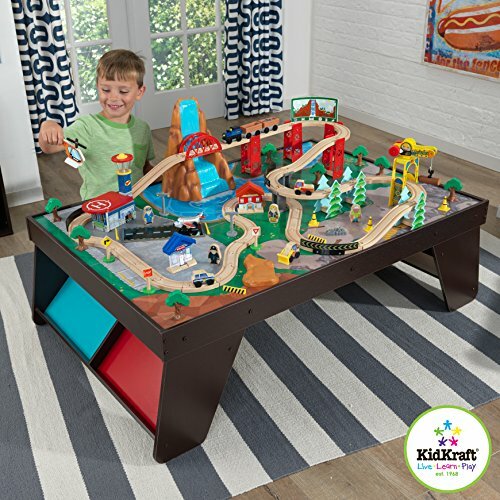 That is why we thought of giving you a list of the best-selling and viably strong and durable KidKraft train tables to help you narrow down your search. 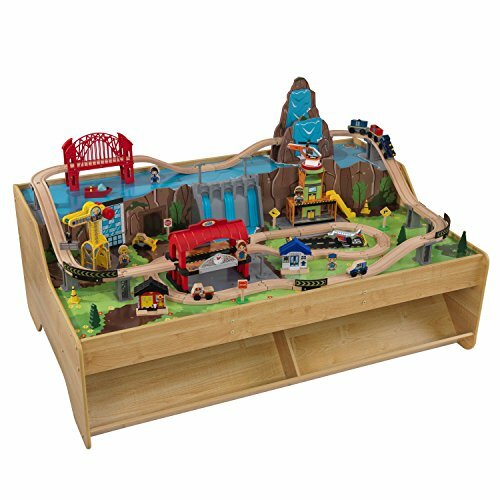 This is the kidkraft wooden waterfall mountain train table and set. 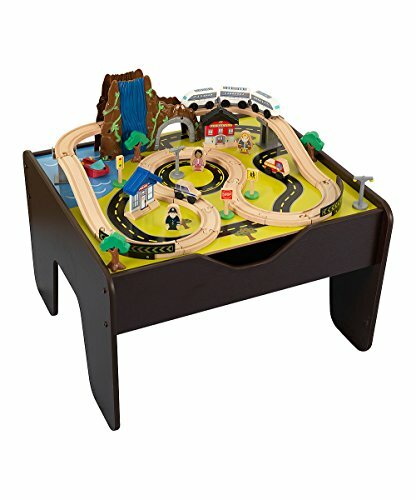 The table, with all practicality, comes with a train set that provides more imaginative and creative play for your kids. The table have T-molded, curved edges for safety and an elevated edge for security. The design keeps your children away from injuries of a pointed edged table and secures their play-set on the top surface. It comes with a free, 3 pieces, large plastic bins for easy storage and organization. You should know that the table has a fairly large size and coated with a nice shiny finish. It is also built durably and reliably strong. The table comes with a kidkraft wooden train set. All of it as seen in the picture can be availed at a very affordable price. It is a great table and train set for beginners or for newbies who is just about to start a train play-set for their kids. It is made with high quality composite materials of wood and plastic. It requires some assembly but all thanks to the detailed and step-by-step instruction manual, you will only invest minimal effort and supervision with its connectivity. The table’s height is appropriate for your kid’s eye level. It is very large and spacious wherein multiple kids can enjoy the set and occupy the space in most corners. It is not unusual that a Kidkraft wooden train table does come with a train set. The marketing set-up of that is actually to your advantage as it is expensive enough to buy a train table, let alone a train set. This amazing, two in one package of a play-set is best for children. The table is safe to have the train set lay out as it has its edges curved for safety purposes. Children are prone to accidents due to their undeveloped physical abilities and a pointed edged table might cause them injuries. The train set also comes in colorful and vibrant train pieces, most of which are highly detailed and made from non-toxic, durable plastic materials. The table comes little expensive but with a train set included. The table is with great aesthetics and coating/color which is very elegant and appealing to the eye. It is constructed from high quality, thick wood which ensures durability and longevity. One of the nice features of the table is the large drawer. A plastic bin which usually comes free in a table set is good but a drawer makes things more organized, especially with those tiny train set pieces. It lacks the curved edges but it levels well with a child’s seated height. It includes 100 wonderful pieces. There are bridges, tunnels, train tracks, cars and figures included. The top surface of the table has a laminated play-board to cover the ground layout of the train set. This is the kidkraft wooden train set that features an Aero City. The set comes in a nice, decent, play-board laminated train table. It consists of 85 durable pieces, made from durable wood and non-toxic plastic materials. The rectangular table comes with bins that can be laid out on a slanted position in between the legs of the table. It creates a nice and accessible organization of your play-set and train pieces. 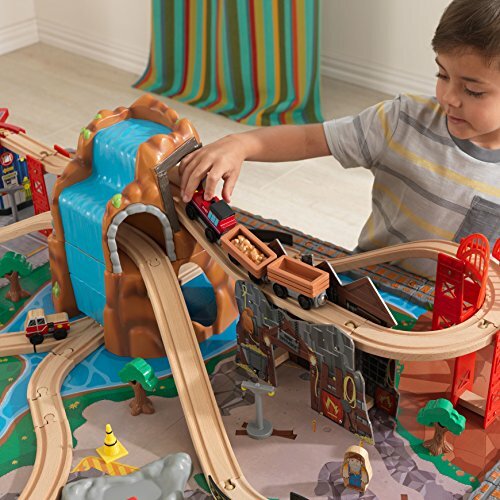 The wonderful train set is complete with mountain, tunnel, bridge, city and building tracks. One of their affordable set, but on a smaller scale and a moderate amount of train pieces is this fun and wonderful Transportation Train Station Set. The table is fairly simple but built with great durability. It does not have any curved or elevated edges but it can hold a train set with great stability. The table is perfectly leveled, to avoid your train from tipping off. The table set includes 58 fun and colorful pieces. This is a table ideal for beginners. 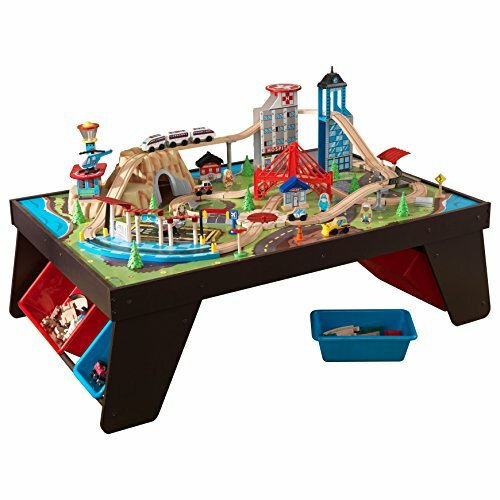 This is the popular kidkraft wooden waterfall mountain train table and set. 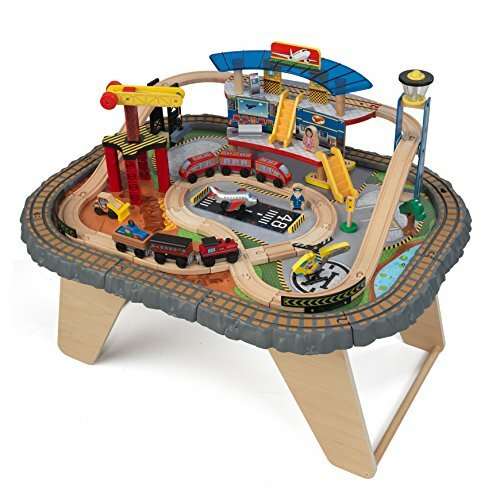 It is a limited edition table and train set built for both comfort and kid’s satisfaction. It has 2 drawers located, one on each side to where you can store 120 of the colorful and detailed train pieces. This table requires some assembly. The table is advised to be assembled and connected by an adult and the train pieces can be done by kids with only minimal adult supervision. It comes with a detail manual to aid you in assembling. It has curved and elevated edges to provide security over the pieces on top and safety from pointed edges. It just wouldn’t stop. 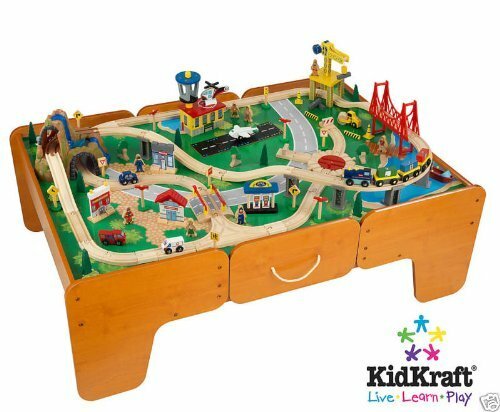 This is a Kidkraft train table featuring an expressway train set. It includes 75 pieces of train parts and accessories such as helicopters, airplanes figures and train tracks. In addition, the compatibility of the train set is with great versatility. It could connect to most known wooden train products such as Brio and Thomas & Friends. The set uses a standard train track. 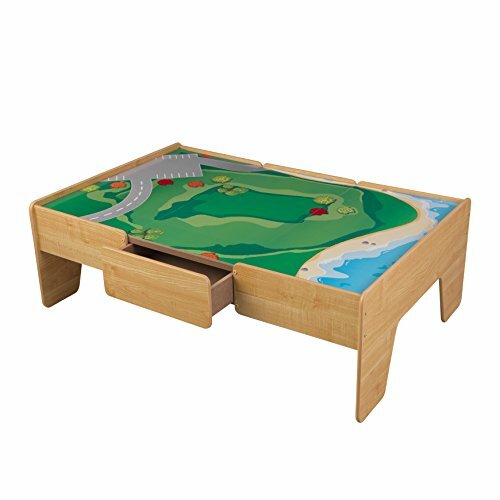 The table is simple and with no containers or bins but is durable and reliable to withstand different children’s play-style. 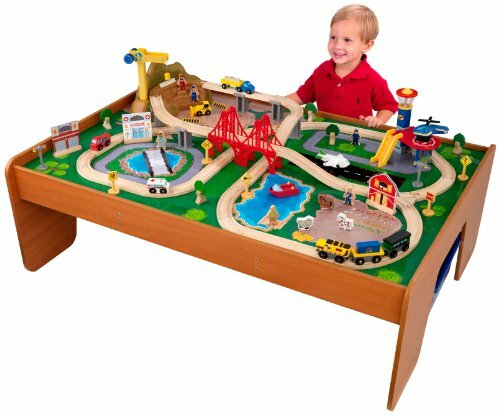 This is an affordable Kidkraft table but does not include a train set. 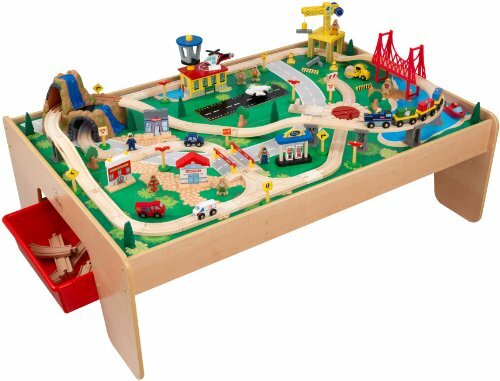 The surface or the top part of the wooden train table has a laminated play-board to fit perfectly to any type of train lay-out. It has 2 drawers on two of its side. The great thing about this table is that it can be used for any forms of activity. It can be great for children who are into arts and crafts. The ideal design is intended for a train set but the application is very wide. There are only a few of this left in the market. This table set includes a train set of 112 pieces. There is also 4 large plastic bins which can be easily laid out underneath. The bins are enough to store and contain all the train pieces and accessories. The table has a flat surface applied with stone-like crafting on top. There is no elevated edge to keep the surface secured from train pieces tipping off. There is a molded waterfall mountain an a bridge for a nice train track lay-out. 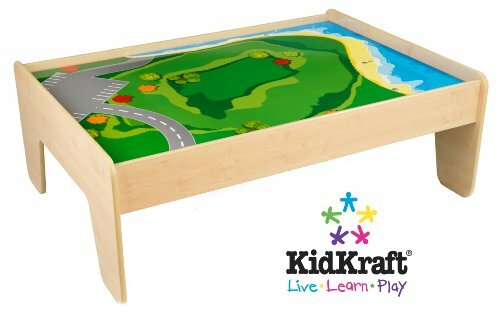 This is a T-molded edges KidKraft table. 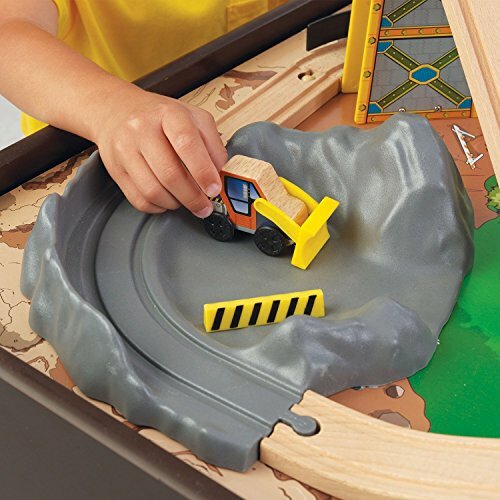 The feature prevents chipping or train pieces falling off the table. It is built using hard and thick wood. The construction and the sturdiness of this table is far more worthy given its price. There is a laminated mountain green lay-out on top. The table is ready for any train set to be laid out to. It does not include any train set but could accommodate most types. It can also be used for other learning activities. This table has a taller height compared with other table set. It does not have a very large table dimension but it could accommodate multiple children playing. This is great for kids aging 3 and up. It is great for beginners as it comes with a free train set, complete with train tracks, figures, detailed city lay-out accessories and 3 pieces of train cars. There is also a nice, vibrant, yellow play-board layout on top. As seen in the picture, it is not like the usual train table. It has a unique one-sided design. One side elevates as part of a mountain dam design where train tracks pass through. At one side, on the bottom part, has a shelf to where you can put your storage bins. The storage bins is included in the set. There are only a few of this table left in the market. The table is comes with a train set and a train track made from durable wood and plastic materials. You’d also see that the table is very sturdy. Screws are neatly placed at all corners, holding the table firm and stable. 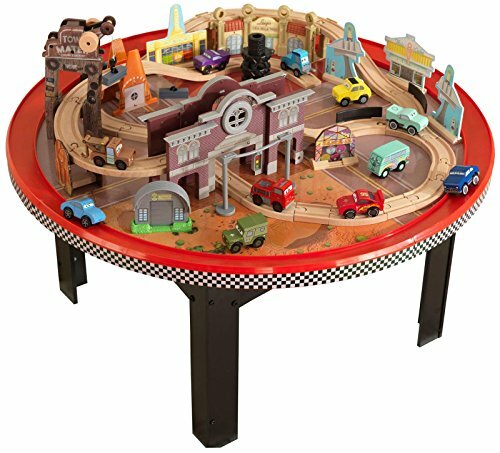 This is a Disney/Kidkraft train table and set. The table is roundly shaped. That is to make use of the space wherein kids can seat anywhere around it. The table includes a train set, although it uses plastic cars instead of a train car. It uses a standard wooden track which is compatible with most wooden train set. This table and set is actually inspired from the movie “Cars” back in 2006. 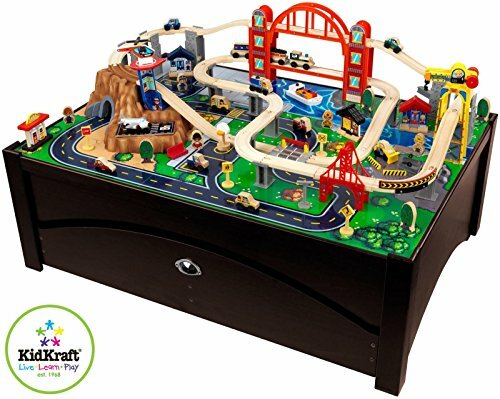 Another great kidkraft wooden waterfall mountain train table and set you can buy. The nicest thing about Kidkraft table is that the package usually includes a train set. It is ideal for parents who wants to buy a complete set and does not want to effort much making another purchase for a train set. The table has its own design of a city train based theme on its sides. It includes all the train accessories needed by your children. 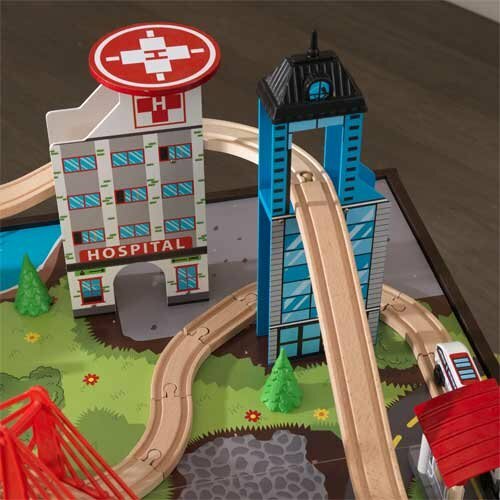 The most and possible expensive train set and table from Kidkraft is this Super Highway Set. It is a square table of a larger size completes with looping train tracks and tier 2 bridges. The assembly of the train set as seen above requires some assembling skills. A child might not be able to connect all the pieces therefore requiring adult’s supervision. It includes all the necessary accessories to build a fun train layout. The table has built-in shelves underneath for storage purposes. 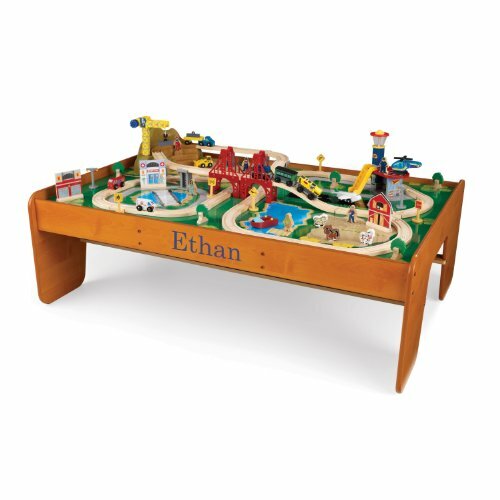 Lastly, a rectangular train Ethan – Kidkraft train table. It is coated with a nice and shiny finish. The table is remarkable in terms of durability and sturdiness. It does not have any features such as drawers or shelves but it is known to last longer and reliably strong compared with other wooden train tables. It is also a complete pack of table and train set. There are 100 colorful pieces included to build a complete city themed train set.